According to the United States Department of Agriculture (USDA) Animal and Plant Health Inspection Service (APHIS), August is Tree Check Month. Specifically, residents are encouraged to keep an eye out for signs of the extremely destructive Asian longhorned beetle (ALB). This invasive beetle, a native of China, could attack many of our valuable native tree species, including maples, birches, poplars and willows. Only a few ALB populations have been found in the U.S., but two of those, one in southern Ohio and one west of Toronto, Ontario, are close enough to be a concern. Although the beetles themselves don’t travel far from year to year, humans assist in their spread by moving wood materials such as infested firewood. Adult Asian longhorned beetles have large, shiny black bodies with white markings and very long antennae with alternating black and white bands. They are 1¼ to 1½ inches long. The most serious damage is done during the ALB’s larval stage. After hatching, small larvae feed under the bark, much like emerald ash borer larvae. But as the ALB larvae grow larger, they chew tunnels into the heart of the tree. After pupating under the bark, the adults emerge from large exit holes, up to half an inch in diameter, on branches and trunks of trees. To date, ALB has not been detected in Michigan. Michigan State University Extension educators have been hosting programs to help residents keep a lookout for this pest through the Eyes on the Forest program. As more people become aware of this threat, however, a few lookalike beetles can cause unnecessary alarm. There are two specific native beetles that are easily mistaken for ALB. The cottonwood borer colonizes poplars and willows and also has a large, shiny black body with white bands or spots. However, there is a lot more white on the bodies of cottonwood borers than on ALB beetles. The antennae of the cottonwood borer also lack the white bands that are typical on ALB antennae. Larval feeding is also different. These native borers feed in the large roots and root collar of trees, and emerge as adults from those roots. There are no large round exit holes on tree trunks or branches. The other native beetle that is most commonly mistaken for ALB is the whitespotted pine sawyer. Although also dark colored, the male adult beetles have one white spot on their back, while the females are mottled brown. These native beetles are also smaller, usually about three-fourths of an inch long. 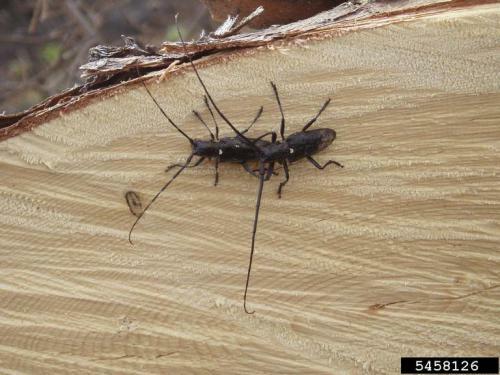 Sawyer beetles and their larvae are only attracted to severely stressed, dying or recently killed or cut trees. Sawyer beetles only feed on pines, spruces and conifers, whereas ALB beetles are not at all interested in conifers. 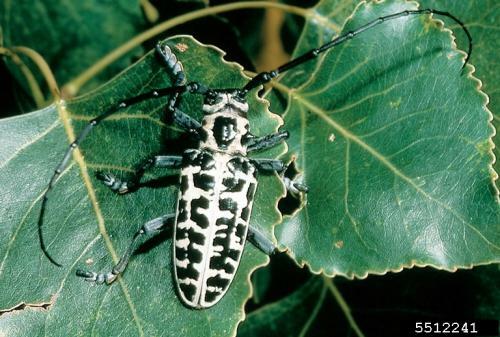 For more information on the Asian longhorned beetle and its threat to our maples and other tree species, visit the Michigan Department of Agriculture and Rural Development’s ALB website. And remember, please don’t move firewood! Buy from local sources when traveling.